God = Placebo - Website of reckersworld! God is a very powerful placebo. Now hold on just a minute, you are saying. A placebo? No, God is way more than that. Without God, I would not have achieved what I have achieved in my life. I would not have overcome the personal difficulties in my life, bettered myself personally, overcome various sins, addictions and obstacles. I would not have reached the point in my life, having achieved the success I have achieved without God! Yeah, yeah, yeah, that’s what every theist says. Anyone who ever believed in a god claims these exact benefits, whether they are Christians, Muslims or whatever. No matter what denomination. Whether they are part of a cult or a mainstream church. They all claim the same advantages and privileges of their relationship with God. They all claim that God answer their prayers and helps them. None of them believe they are worshiping false or imaginary gods, although every Christian knows that most are. When you look at other religions, or when you look down on other denominations and fringe Christian groups, you point the finger and think “That person is worshiping a false god.” Or “their god is imaginary”. Yet, those exact same people are insistent that their gods do for them what your god does for you! Because a belief in god is a PLACEBO! Whether your god is real or whether it is fake or imaginary you will gain EXACTLY the same benefits as those who worship false or imaginary gods. You will also achieve exactly the same things that ATHEISTS do without the need for gods. YES, even atheists overcome obstacles, better themselves as people, achieve goals etc etc, and they do it all without the need for the god placebo. So a real god is clearly not needed. So why do you believe you are any different? A boost in self-belief as you believe you have a supernatural being backing you and supporting you. Peace in that you believe you don't have to face death and that you will live forever. Belief that there is something higher you can cast your cares upon. Belief that God will protect you. Belief that everything is part of some higher purpose, no matter what difficulties you face. Belief that problems are being solved because of your prayers. Faith that you can move mountains. Belief that there is power in the name of your god. Every single one of the above things can be gained by belief in a god whether that god is real or not! Assuming that there are real gods, there are two types of theists (god believers). 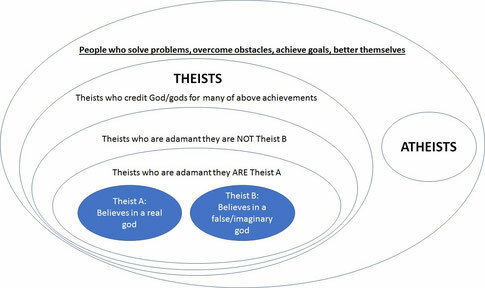 Theist A are those who worship real gods and Theist B who worship false or imaginary gods. Yet both groups insist that their god does those things mentioned for them. They are adamant! Both insist their gods are real and both are adamant that their gods are not false or imaginary. Yet they get the same benefits! So what does that tell us? What it tells us is that in all likelihood they are achieving these things themselves without any gods... just like atheists and that their beliefs are acting as a placebo, ie giving them self-belief, motivation, empowered thinking and determination. Why should anyone believe you are special when it comes to getting benefits from some all-powerful god?